Planning. How to find better fares. One of my friends dropped me a message earlier today asking for a few pointers about trying to get some good fares; he was planning a trip to Australia and New Zealand in a couple of months. 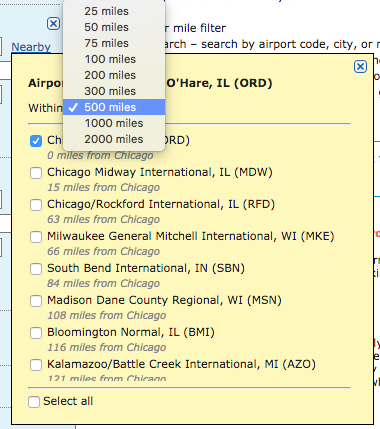 He’s a pretty experienced traveller, being a United 1K for a number of years and living in Chicago, so I ran through a few options that I was able to find. I figured it was worth writing this up in a post to run through my thought process to see if it would be useful for others. 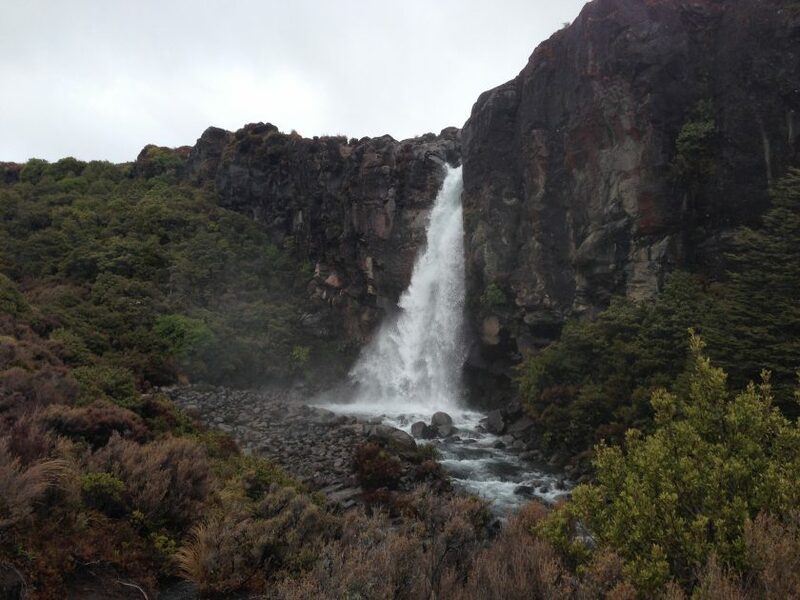 As I mentioned, he was looking to take a three week trip in October, with a week in New Zealand and two in Australia. 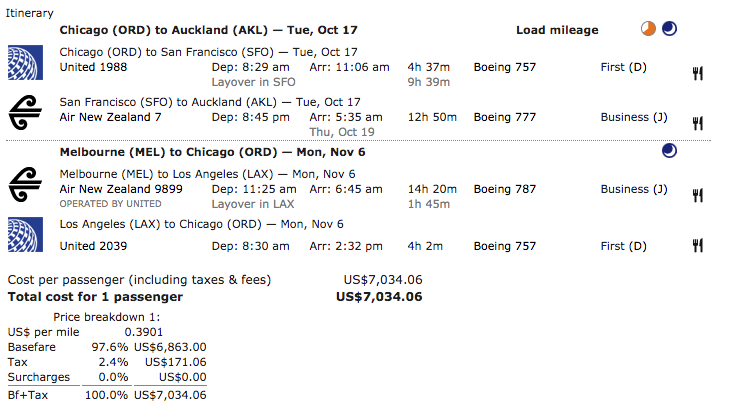 The most expensive part of the trip was going to be the trans-Pacific flights down to that part of the world. Being a United 1K and already made his EQD (Elite Qualifying Dollars) target for the year, he was looking to stay loyal to Star Alliance, and United if possible. My go to tool of choice is ITA Matrix for doing airfare searches. Google Flights is a cut-down version, but I do prefer ITA Matrix is it gives you more options for filtering and searching. One of my key recommendations when trying to find a deal is to be as flexible as you can with dates. Ideally when searching look for at least plus or minus a couple of days. ITA Matrix has a number of options for doing this. The next tip that can literally save thousands is to be flexible with your origin. For example, with this trip, if my friend were to start and end their journey in Chicago, they’d be looking at something north of $7,000. However, ITA Matrix has a really handy feature for selecting airfields near you. Just click the Nearby link and a yellow box will pop up giving you a list of the nearby airports. There’s even a drop down to select the search radius. I wouldn’t suggest selecting every airport in a 500 mile radius but pick a few of the larger ones. Also, not every airport will give you a different fare. In this case, I actually picked a couple of Canadian airports, namely Toronto and Calgary to search from, which in terms of travelling time from Chicago isn’t actually that bad. Both United and Air Canada are part of Star Alliance so there will be a significant number of flights between those cities, meaning my friend had a high likelihood of getting either a cheap flight or using his miles to position for the first segment. The final airport that I picked was Minneapolis St. Paul (MSP). Why? Minneapolis is a huge Delta hub (Delta are part of SkyTeam) and my friend is a Star Alliance person. Sometimes (but not always), airlines target competitor hubs with lower fares to try and tempt that relatively captive audience away from their preferred alliance. So in the end, my search looked like this. From looking at the first set of results it was apparent that the Canadian airports had the better fares. Given the fact that Calgary was substantially further away from Chicago than Toronto, I focused on that. Tweaking things around, I was able to come up with this itinerary. That’s a pretty good saving over what he was looking at previously. However there’s one further change that we can make so that it would be more convenient. 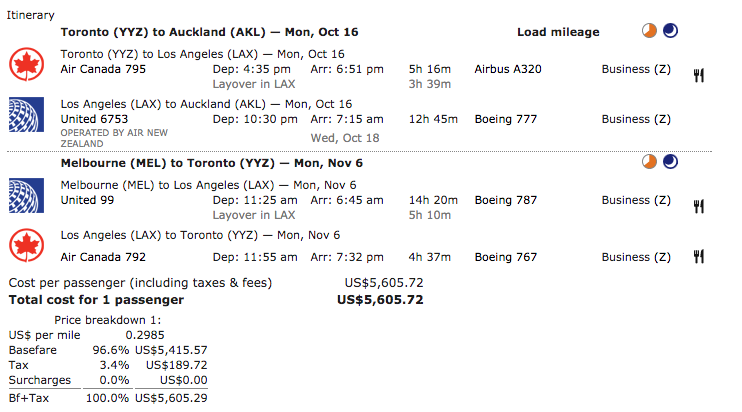 If we notice on the return segment, he’s flying from Los Angeles through to Toronto. That’s pretty much flying directly over Chicago. 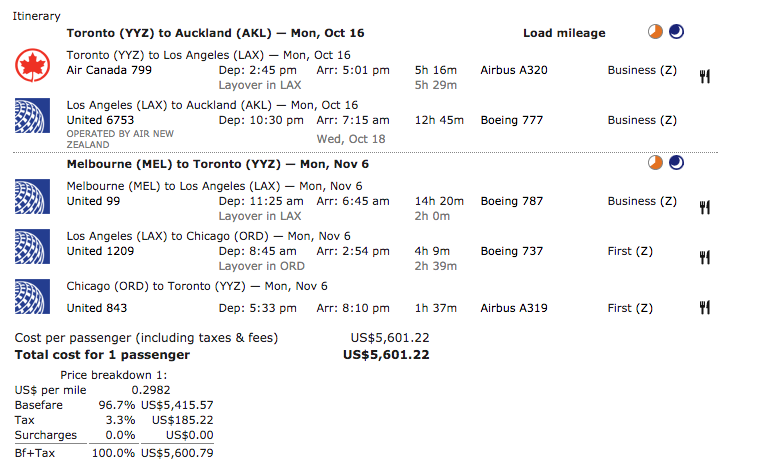 My guess is that we can probably add in an extra segment so that he could fly Melbourne to Los Angeles to Chicago and then to Toronto. Once there, he might decide not to take the final flight – there may of course be a family emergency, or he could feel unwell! So many things can happen when travelling. This is very easy to search in ITA Matrix. When we turn on “Advanced Controls” there are two boxes that are available to us. The first one we can enter in routing options. The “x:” specifies a particular airport to connect in. So in this case I’ve asked ITA Matrix to make me connect in Los Angeles (LAX) and then Chicago (ORD). 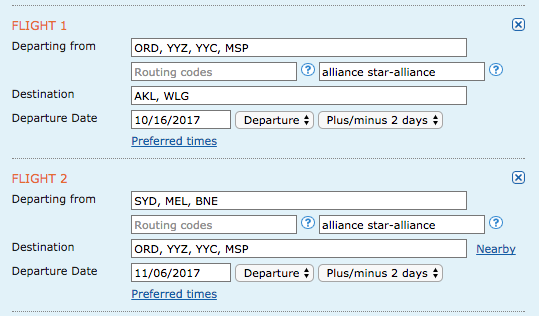 The order of the airports is important – if I did it the other way, it would be looking at flights from Melbourne to Chicago, to Los Angeles to Toronto (and would likely throw an error). The text in the second box has allowed me to specify a particular global alliance to use, in this case Star Alliance. Alternatively we could use oneworld or SkyTeam. So with all of that, we get the following result. All he would need to do is spend the $150 or burn a few miles to get to Toronto to start the journey. Or even go there a couple of days before for a weekend in the city. Hopefully this helps give a little bit of insight as to how I use some of the tools available online to find good deals. If you’ve got any more tips or suggestions, I’d love to hear them. Previous Post: More on the Air Berlin insolvency. Next Post: In pictures. Tatio Geysers, Chile.